When it comes to online gaming, we all like getting something for nothing – and the relatively recent addition of Fortune Fiesta casino and games to the online scene has meant that there are now even more chances for us to claim free games and chances to win big with very little in the way of cash having to be put in! You can get 100 bonus spins when you join this site and play their games. GET 100 FREE SPINSNew Customer Offer. T&Cs Apply. 18+. Please Gamble Responsibly. Win a fortune at Fortune Fiesta! There's plenty to win and lots of games to enjoy. The site is run by 888 Group and operates via the popular Dragonfish platform, which is one of the most fluid and accessible online gaming standards around. This platform is well-known for providing bingo games to the masses but, on this occasion, we’ll be looking at mainly slot games and casino standards all wrapped up in a distinct Latin flavour. Don’t fall into a siesta while playing at this site, there’s too much going on! The site is bolstered by plenty of big name game developers and is overseen by a number of gambling authorities, which of course means that you are always assured of a fair and fun experience each and every time you spin those reels. Despite this being a relatively new site, there’s plenty of buzz around with regard to the brilliant bonus codes awaiting you when you first sign up, as the site has a unique welcome package which we will go into further detail for you below. As always, however, it’s important to look beyond the obvious promo codes and to consider what else makes up a site and whether it is worthwhile signing up to! We have done this in our Fortune Fiesta review so keep reading to learn more. Despite the site’s rather simple appeal on the face of things, the opening Fortune Fiesta promo code is rather unique, something which may even court seasoned gamers to get involved with. You’ll be able to grab up to 100 free spins on a big branded game or two here at the site providing you pay in regularly, meaning that you’ll need to really show your loyalty if you stand any chance of benefiting from a nice chunk of free bonus cash. 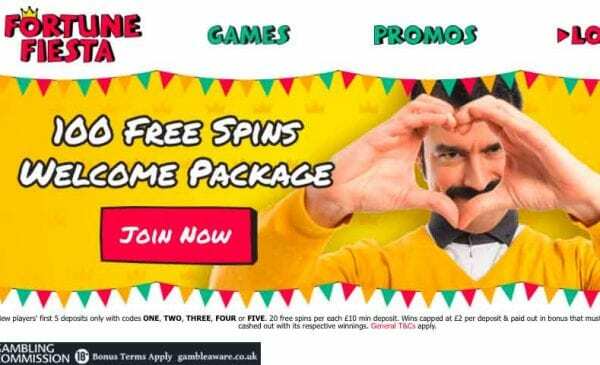 This isn’t necessarily a bad thing, particularly as the minimum deposit involved for this deal is £10 – so that’s £50 in, in all, to get 100 free spins back. There are worse deals out there! For another great offer similar to this one, check out our Spins Royale review. How it works is that you’ll get 20 free spins back for each of your first five deposits of at least £10, meaning you’ll get these free chances added to your account in increments. This means you need to come back regularly to cash in once you’ve entered in the bonus code that applies. What’s really appealing and interesting here, however, is the fact that this deal is completely free of wagering, meaning you can get into a whole host of games and can stand to win off your free spins without having to pay anything back. This should be a very big draw for those players looking to win big and win often – as well as a nice little bonus for anyone just looking for a fun time online. Dragonfish always lays on their promotions thick and fast, and this site is no stranger to the rule, there’s a number of prizes and perks on offer regularly, with chances for you to enter prize draws to win even bigger prizes, too – a nice little touch that we think many casinos elsewhere are missing out on! It’s thanks to the solid developmental support and the Dragonfish engine itself that there are so many great games to enjoy here. We love the fact that the games are easily found and well-signposted, meaning that if you prefer the latest casino games to slots, or even fancy a go at an online scratchcard, you can feel free and leap from game to game without having to look too hard. This is always a good thing in our book – and it makes things even easier for mobile gamers. There are even sections for each different theme and type of slot game on the books, too – and you can enjoy big name games and brands such as Aloha!, Finn and the Swirly Spin, Jack Hammer, Monopoly On The Money and even Motorhead – as well as various different twists on casino games and keno. All the games are largely swept into one catalogue here, which isn’t a bad thing – especially when everything is so clearly signposted otherwise. Another great factor here is you may take a clear look at all the games and casino emulations on offer before you start – there are many different big name sites out there which ask you to sign up before you even get a peek at what’s behind the login doors. Dragonfish has always been more than welcoming in this regard, however – making it easy to find Fortune Fiesta casino games and to take a good luck at what’s in store. We’re confident that even seasoned gamers will find a title or two in here that they won’t ever have tried before. Why not give it a look? A good gaming site needs good developmental support and solid games – and 888 have always partnered with the best in-game providers and engineers to ensure that their catalogues are stacked to the brim with a variety of titles and brands. This site is absolutely no different – and what’s more, it comes with the added benefit of having the varied and streamlined Dragonfish system behind it all when you use your Fortune Fiesta login. See our Marina’s Bingo review page for another brand with the same software. As well as 888 Holdings’ own offerings, there are games provided by NetEnt, IGT, Nyx, WMS, Pariplay and Eyecon – a nice, solid set of games developers who help to build up varied games packages elsewhere. We enjoy playing on sites that have plenty to offer in terms of games and features – and these are some of the best developers working online today. Do bear in mind that, when withdrawing, it can take a little longer for funds to reach cards and banks directly, so if you’re happy to go ahead and use an e-wallet for your gaming needs on this occasion, we seriously recommend that you do so. There are also plenty of Payforit casino sites available if you’d prefer this method of deposits. You can also withdraw via cheque, though this can take a considerable amount of time! The minimum withdrawal here, too, is £5 – brilliant news for anyone who is seriously interested in taking cash away quickly. Fortune Fiesta mobile gaming is a breeze, as with other sites based on the Dragonfish engine, this site offers you simple, streamlined gaming that’s built for phones and tablets. This means that you can easily login through the main site from your chosen device and browser and can leap into a range of games that have been purposely designed to operate on the go. What’s more, in a rare move for the Dragonfish engine, if you have an Apple device, you can download a dedicated app for the site – meaning that the brand has developed a specific engine for phone and tablet users should they wish to play slots on mobile. This is great news – and, during testing, we experienced no problems with either the mobile site or the app. This means we seriously recommend you give it a download if you’re using an iPhone or an iPad – you could be missing out! The casino games come in thick and fast and are dead easy to spot – and what’s more, this is a relatively new site with plenty of competitive edge. Use the Fortune Fiesta promo code when you sign up to get the most for your money when depositing. Very reasonable banking and wagering terms mean that this brand genuinely cares about you having fun and winning regularly. No matter if you’re the sort of player looking to have a bit of fun, or to win big, there’s plenty to get involved with here and we genuinely recommend you give it a look. If you enjoyed our Fortune Fiesta review, download the app and get yourself spinning!